Michael A. Cardozo, New York’s corporation counsel, and Muriel Goode-Trufant, a senior city lawyer, supported a new approach. 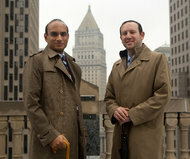 Afsaan Saleem, left, and Gabriel Harvis are plaintiff’s lawyers whose firm was involved in three recent trials against the city. The city also noted that the number of such suits that are dismissed or withdrawn before trial rose by about 75 percent in the first year after the policy went into effect. Those cases had been typically viewed as not being worth the time or expense to fight in court. But city officials said they had concluded that while settling small-scale federal lawsuits might have been expedient, it did nothing to discourage lawyers from bringing marginal lawsuits. The city’s Law Department directed its staff to identify civil-rights lawsuits that it believed were based on weak evidentiary or legal grounds, city lawyers said. Those cases were designated “no-pay” cases. The city would seek to have such cases — which typically accuse the city of rights violations like false arrest, malicious prosecution or use of excessive force — withdrawn or dismissed, and where that failed, it would forgo settlement talks and push them to trial. About 60 cases are currently pending trial; the city has declined to settle 52 of those cases, Ms. Goode-Trufant said recently. She said the city had also begun pushing more cases to trial in which the plaintiff had rejected the city’s last settlement offer. Over the past year and a half, she added, the city has won two-thirds of about 30 such trials that have been held. Another plaintiff’s lawyer, Gerald M. Cohen, whose firm has been involved in four such trials, said the city’s new approach had made him more selective about which lawsuits he brought. Mr. Cohen’s firm lost two trials but also beat the city twice, including winning a $190,000 verdict in a false-arrest suit in which the judge also awarded $208,000 in legal fees. “I think in the end, it’s going to cost the city much more money than it’s going to save,” he added.